Jodiawala and Khambatis joined hands to establish a state-of-art wooden packaging solution in Pakistan capable of catering to all business and domestic needs. With an experience of more than 100 years in the field of timber sales under its watch, Jodiawala is among the pioneers of softwood import in Pakistan. It is one of most trusted brands that has been importing woods from Europe, North America, Russia and Baltic countries for over a century now. Until recently, the Kingdom of Saudi Arabia had been the main market for Khambatis. With hands on experience of more than 15 years of operation excellence in the Kingdom, Khambatis are well positioned to diverse the circumference of their operations i.e. Wooden Packaging expertise by expanding it to Pakistan and new frontiers. Thus, both companies decided to work with a combine expertise under the name and design of JK Packaging which is the combination of two masters who know about the industry and art of wood for generations. 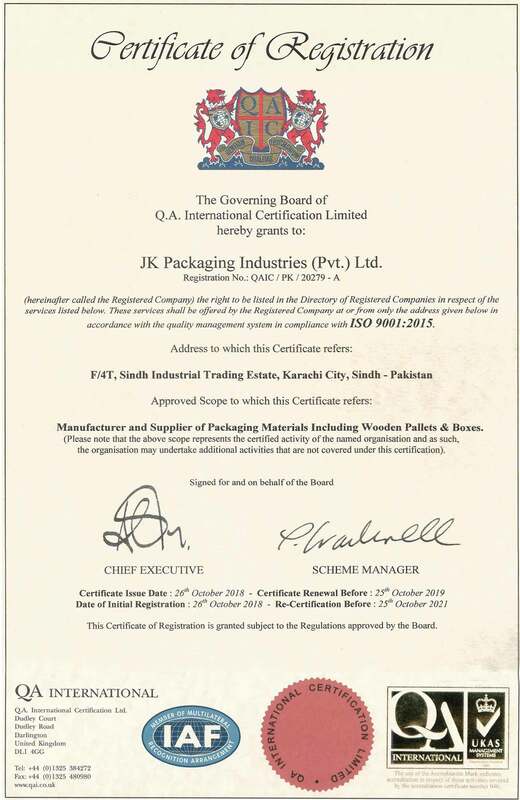 JK is determined to bring innovative solutions to the industry needs in Pakistan with a high quality wooden packaging products. To set a new standards of excellence for creating higher economic value for our clients, logistics and warehousing industries by offering the best quality products ideally suited to client’s needs at competitive prices. We aim to become the preferred partners of our customers by offering solutions and services that are individually optimized to exceed the customers’ expectations through enhanced quality by bringing innovation and efficiency. Trust & Integrity: Do what is right not what is allowed. Collaboration: Leveraging our strengths and capabilities across the organization to earn our customers’ respect and loyalty. Customer Focus: We are passionate about our customers’ needs and desire and embrace their priorities as our own. Social Responsibility: We act responsibly and ensure the safety of our people and products. Excellence: We strive for excellence and improvement in everything we do. Quality Assurance: We provide our customers the highest quality products. A wide range of Wooden Packages and Wooden Joinery Works are being offered with the use of our SawMill Facility which can exceptionally craft logs to any sizes and shapes. One of our main products is packaging wooden pallet. They are quite unique in design as we offer Block Pallets, Bearer Pallets, and Heavy-Duty Industry Pallets etc. Our pallets are made of soft wood such as Pine and Spruce. Spruce is a soft, durable, strong and easy to handle wood. Another J.K Packaging’s product is the cable reels. We offer a range of different sizes of cable reel drums, the robust and solid construction of these wooden reels make them reliable and long lasting. Wooden Crates provided by us are used in transportation of various kind of materials and goods. We design a range of Wooden Crates, used for multi-stacking and multi-handling, to be sturdy and durable. Our company provides Wooden Crates at highly competitive prices. J.K Packaging provide customers with standard and custom configurations that meet commercial and military requirements in all sizes. JK Packagings is dedicated to become a groundbreaker in the provision of quality products and services, and to exceed the required expectations of valued customers. Stern Quality Control process is carried out in order to deliver a desired product with outmost perfection. Quality control and inspection are done in all production stages, beginning from selection to delivery of raw materials until the dispatch of finish products. Regulation of wood packaging material in international trade. ISPM 15 treatment applied to all pallets manufactured by JK Pallets are natural and environmentally friendly; we do not use any chemicals. This heat treatment (HT) involves placing pallets in a treatment enclosure/ drying chamber in which the wood is heated. The core temperature of the wood must reach a minimum of 56°C for at least 30 minutes. This eliminates all harmful organisms likely to attack standing plants. ISPM 15 stipulates that every collaborating country regulate wpm through their National Plant Protection Organization. For the united states, the NPPO is the US Department of Agriculture Animal and Plant Health scrutiny Service. Through a note of Understanding , arthropod genus licensed the yankee Lumber Standards Committee to administer the ISPM 15 program. Currently, there are 2 choices for certified treatment, typical heat treatment and bromide coating. NOTE, THERE ARE SEVERAL DIFFERENT, ACCEPTABLE FORMS OF THE ISPM 15 CERTIFICATION STAMP AS DESCRIBED ABOVE.